The 2017 Betway UK Championship Snooker is about to kick off from 29th November and if you want to watch all the action from abroad we’ve got the details you need. 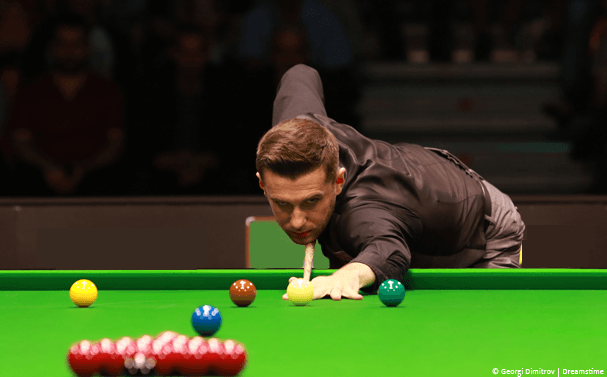 The UK Championship Snooker is the second largest ranking Snooker event in the world and this year Mark Selby will return to protect his crown. In 2016 Selby beat 5 times champion and Snooker legend, Ronnie O’Sullivan taking his second title and he will no doubt be wanting to add a third this year. If you’re outside the UK watching the action can be difficult, not all countries show Snooker on TV and if they do it’s often on expensive cable networks. Below we’ll teach you how by using a small app called a VPN you can watch the 2017 Betway UK Championship Snooker abroad in just 4-easy steps anywhere in the world. The entire tournament bar some early games are being shown live on BBC iPlayer from December 2nd right up until the final. Unfortunately if you’re outside the UK on holiday, an expat or for whatever other reason then you’ll be blocked with a message a little bit like this one. The BBC iPlayer blocks you because it can tell you’re not in the UK. The good news is, there is a small app called a VPN that lets you disguise your online location to make it appear as if you’re elsewhere. Below we’ll show you the four simple steps to getting a VPN and using it. This will ultimately unblock BBC iPlayer and allow you to watch the entire 2017 Betway UK Championship Snooker abroad regardless of where you are in the world. A good VPN suitable for streaming video such as the Snooker will cost you between £3 – £5 depending on how long you sign up for. This works on any Android, Apple, Windows or Mac device. It is also possible on Amazon devices such as the Amazon Fire TV and Fire TV Stick or with Kodi installed. Visit the VPN provider IPVanish and sign-up by clicking here (There’s also a 7-day money back guarantee so no need to worry). Download the correct app for your device from the Apps section of the IPVanish website. Install the app and run it. When required to login enter your login and password details chosen when signing up. Select United Kingdom and press Connect. Once you’re connected all you need to do is head over to the BBC iPlayer website at the time the Snooker matches are being played, you can now watch them all both live and on catch-up TV. There are other VPN providers available and if you want to shop around then three more we recommend are ExpressVPN, NordVPN and CyberGhost VPN. Can’t find the correct options? 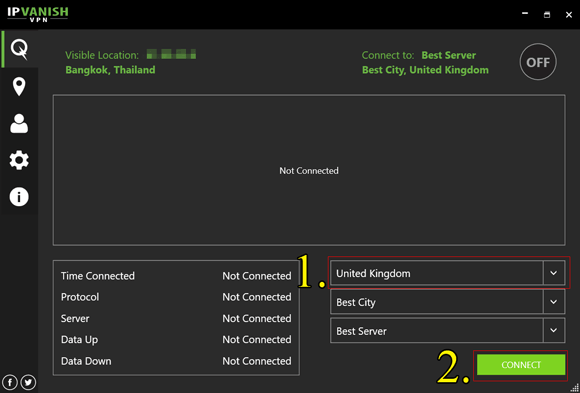 If you’re having trouble locating the correct options on the VPN app or you’re still a little concerned that it’ll be too difficult for you to do then take a look at the two example images below. The first shows the 3 clicks needed to get connected on a mobile device such as an Android or iOS phone or tablet and the second shows how to do it on a regular computer which takes just 2 clicks. When you’ve finished watching all you need to do is press Disconnect and your internet connection returns to normal. When you want to watch another match just reconnect in the same way. There are no limits on how many times you can connect or disconnect. If you’re still having problems there are some easy solutions to fix nearly all issues. The first and one that will fix 99% of issues is to change server. Especially if you’re receiving the message on BBC iPlayer that you’re outside the country while connected to the VPN. You can do this by pressing “City” on a mobile device or “Best City” on a computer and selecting a specific city. For example, we used Liverpool. Then press on “Server” on a mobile device or “Best Server” on a computer and select a specific server. We selected lpl-c01. You should now reconnect. You may need to play around with different cities and different servers. The next solution to try is to open your web browser in InPrivate or InCognito mode, then try visiting the BBC iPlayer website. You can find details about how to do this by searching Google. If you’re interested to know when and what games will be streamed live, check the schedule below. Don’t forget you can watch all of the action both live and on catch-up TV simply by getting yourself a VPN app. You can get one by clicking the link below and then follow the instructions from earlier in this guide.